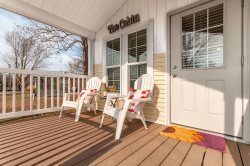 Treescape is a beautiful tiny house vaction rental at The Village at Flat Rock, NC. Treescape, sleeps 4 or more. Nestled under the trees tucked in the Village at Flat Rock, NC. Escape to this tiny house to feel rejuvenated and energized! It has a special feel to it, from the lovely high open screened deck with comfortable deck furniture to enjoy outside living. Inside feels spacious with high cathedral ceiling, gas fireplace, cable tv, private bedroom, Queen bed. A futon in open area for 2 more guests or climb the ladder to the loft. Well equipped kitchen with a nice breakfast bar and seating for 4. Enjoy Keurig coffee, all appliances are full size, plenty of settings, and all you need to prepare favorite meals. The full bath is spacious and offers a walk in shower. The cubby now provides a small desk and chair for computer time. Explore the local attractions, minutes to DT Historical Hendersonville, Breweries, Wineries, Eateries, shops, hike the DuPont State Forest, The Carl Sandburg National Park, Visit the Biltmore Estate and Antler Hill Winery for wine tasting, Sierra Nevada Brewery Co., and so much more. Make your reservations today for your Treescape Tiny House Experience. Desk and Chair for computer time. Queen mattress in loft (climb ladder to sleep there, please sign loft waiver). NEW Metal RailS to help with easy climb. New Curtains to the two side windows in the loft for privacy and darkening room. No Pets, No parties or events.